To Cite: Yamazaki S, Takayama T, Moriguchi M, Hayashi Y, Mitsuka Y, et al. Neutrophil Elastase Inhibitor Following Liver Resection: A Matched Cohort Study, Hepat Mon. 2015 ; 15(11):e31235. doi: 10.5812/hepatmon.31235. Background: Sivelestat is a neutrophil elastase inhibitor (NEI) with positive impact on the respiratory complications in thoracic surgery. Based on the findings of a recent study, NEI may have a good response for avoiding ischemia reperfusion injury in liver resection. Objectives: The current study aimed to examine the impact of NEI on the postoperative outcomes after liver resection. Patients and Methods: The data were collected from 374 consecutive patients scheduled to undergo liver resection. Seven perioperative variables were matched on the basis of the patients’ background. Then, the NEI (n = 61) and control (n = 61) groups were compared. NEI was administered at a dose of 0.2 mg/kg/h for three days from the postoperative day 0 (POD0). The liver function, coagulation activity, inflammatory response, respiratory complications, and overall complications were compared. Results: The levels of serum interleukin-6 (NEI group: 113 pg/mL [26.9 - 522.0] vs. control group: 174 [28.6 - 1040.6], P < 0.01) and C-reactive protein (CRP) (2.9 IU/L [range: 0.1 - 8.6] vs. 4.11 [0.3 - 13.8], P = 0.01) on the first postoperative day (POD1) and the alveolar-arterial oxygen tension difference (32.3 Torr [-28.6 - 132.3] vs. 46.6 [-11.2 - 251.6], P = 0.04) on the third postoperative day (POD3) were significantly lower in the NEI group than the control group. The rate of pleural effusion was significantly lower in the NEI group compared to that of the control group [13 patients (21.3%) vs. 23 (37.7%), P = 0.04]. However, the coagulation activities (P = 0.68), liver function (P = 0.69), non-respiratory complications (P = 0.84), and overall complications (P = 0.71) did not differ significantly between the groups. Conclusions: Intravenous NEI administration had positive impact on the postoperative inflammatory response and oxygenation while it did not affect either coagulation or the liver function, as well as severe grade complications following resection. The frequency of postoperative respiratory complications after upper abdominal surgery is approximately 30% depending on the operation procedure and the definition (1-3). Liver surgery has a high frequency, requiring thoracotomy, associated with pleural effusion, ascites and respiratory complications in comparison to other abdominal surgeries, and the reduction of these complications is a key factor to reduce postoperative morbidity and mortality. Neutrophil elastase inhibitor (NEI) (sivelestat sodium hydrate; Ono Pharmaceuticals, Osaka, Japan) is used to treat acute lung injury (ALI) associated with systemic inflammation (4). The efficacy of NEI is shown both in animal models and phase 3 clinical trial (5, 6). Moreover, the prophylactic effect of the perioperative administration of NEI in cardiovascular, thoracic and esophageal surgeries is observed in clinical practices (7-10). Recently, the protective impacts of NEI against hepatic injury and on the microcirculation after ischemia-reperfusion in liver surgery and transplantation are demonstrated in animal models (11-14). In addition, a positive impact on the liver function by suppressing ischemia-reperfusion injury is suggested in humans (15). The current study aimed to examine the impact of NEI on the postoperative outcomes after liver resection. The data were retrospectively collected from the patients who underwent liver resection for liver cancer. Minimization methods and a PC software program SPSS Statistics software package V.21 (IBM., Chicago, IL) were employed to match the patients’ data as closely as possible for seven variables regarding the postoperative complications: age, Child-Pugh class, steroid administration, preoperative alveolar-arterial oxygen difference, presence of thoracotomy, mobilization of the right lobe and operation time. Then, based on the receiving NEI, patients’ status was analyzed. Any patients with a history of general anesthesia and/or treatment of pneumonia within six months before liver resection were excluded from the study. This retrospective data analysis was approved by institutional review board. The rate of overall complications, respiratory and non-respiratory complications, postoperative oxygenation, inflammatory response, liver, and coagulation functional recoveries were analyzed. Laboratory tests, including complete blood cell counts, levels of bilirubin, Alanine Aminotransferase (ALT) and albumin levels, and Prothrombin time (PT) were performed on the day before surgery, just after the operation, on postoperative day (POD) 0, and on PODs 1, 3, 5, and 7. The serum levels of Interleukin 6 (IL-6) and C-Reactive Protein (CRP) were measured to evaluate the surgical stress response. 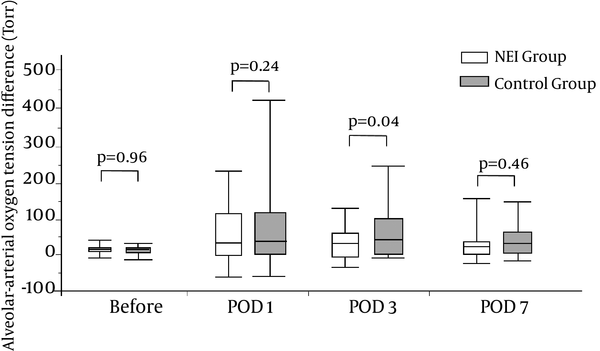 The Alveolar-arterial Oxygen tension difference (AaDO2), calculated based on the blood gas analysis of the arterial blood, was measured to assess oxygenation and peripheral alveolar injury on the day before surgery and on PODs 1, 3, and 7. Atelectasis was defined based on the appearance of the chest X-P findings and it was confirmed by CT when suspected. Pleural effusion was defined as an estimated volume of > 300 mL (≥ 20 mm in subcostal scanning) on ultrasonography. Pneumonia was defined based on a positive sputum culture, which required the administration of antibiotics. Complications were monitored by a separate observer who was not involved in the surgery or the postoperative treatment. NEI was administered by continuous infusion at a dose of 0.2 mg/kg/h diluted with 0.9% sodium chloride for five days, starting from POD 0. The indications and procedures for liver resection were in accordance with the Makuuchi criteria for the hepatic functional reserve (16). Almost all liver transections were performed with intermittent clamping of the hepatoduodenal pedicle (the Pringle maneuver) for 15 minutes followed by release for five minutes. Liver mobilization was performed when the tumor was located in the right lobe of the liver. When the patients received perioperative steroids, 500 mg hydrocortisone was administrated immediately before hepatic pedicle clamping, 300 mg on POD1, 200 mg on POD2, and 100 mg on POD3 (17). The standard systemic antibiotic therapy with cefazolin (Cefamezin α, Astellas, Japan), a first-generation cephalosporin, was routinely administered immediately before surgery and then given twice daily on POD1 to POD3. A red blood cell transfusion was performed if the hematocrit level fell to < 20.0%. A fresh frozen plasma transfusion was performed if the intraoperative blood loss was > 1,000 g or the albumin level on POD2 was > 2.6 g/dL (18). The postoperative management at institution was described previously (19). Continuous variables were compared using the student t-test or the Mann-Whitney U test and categorical variables were compared using a χ2 test or the Fisher exact test. Multiple comparisons were made using the repeated-measure analysis of variance. Statistical significance was considered to be present at P < 0.05. All analyses were performed using the SPSS Statistics software package V.21 (IBM, Chicago, IL). To avoid any selection bias, the seven perioperative baseline characteristics regarding the postoperative complications were matched by the propensity score matching methods as much as possible. Then, the patients were equally divided into two groups of 61 based on receiving NEI administration. The data were retrospectively collected from 374 consecutive patients who underwent liver resection for cancer from January 2006 to December 2009. There were 68 patients treated with NEI after the operation. A matched cohort of patients was selected in a 1:1 manner from these patients. There was no significant difference in the preoperative baseline characteristics between the 61 patients in each group after matching (Table 1). Furthermore, there were no differences in the AaDO2, platelet count, prothrombin activity, ALT, or serum IL-6 levels between the two groups. aAbbreviation: NEI; neutrophil elastase inhibitor. cData expressed median with range. There were also no differences in the type of resection, frequency of thoracotomy, frequency of right lobe mobilization, total operation time, liver ischemia time, or volume of blood loss between the two groups. (Table 2). According to the POD1 laboratory data, there were no significant differences in the white blood cell count, platelet count, albumin level, prothrombin activity, total bilirubin, and ALT. In contrast, the median CRP level on POD1 (NEI group: 2.9 IU/L [range: 0.1 - 8.6] vs. control group: 4.11 [0.3 - 14.6], P = 0.01) and the level of serum IL-6 (113 pg/mL [26.9 - 522.0] vs. 174.0 [28.6 - 1006.0], P < 0.001) were significantly lower in the NEI group. aAbbreviations: NEI; neutrophil elastase inhibitor, POD; postoperative day. bData expressed median with range. There was no postoperative mortality or adverse effects attributed to NEI. The rates of respiratory complications significantly differed between the NEI and control groups [13 patients (21.3%) vs. 23 (37.7%), P = 0.04], with significant differences for pleural effusion [10 patients (16.4%) vs. 18 (29.5%), P = 0.03], but not for atelectasis or pneumonia (Table 3). The other non-respiratory complications regarding liver resection did not differ significantly between the two groups [17 patients (27.9%) vs. 16 (26.2%), P = 0.84]. Additionally, the overall complications did not differ between the two groups [24 patients (39.3%) vs. 23 patients (37.7%), P = 0.71]. The severe grade complication (≥ grade 3) according to the Clavien-Dindo classification and the length of postoperative hospital stay did not differ significantly between the two groups. aAbbreviations: NEI, neutrophil elastase inhibitor; POD, post-operative day. bData are presented as No. (%) except post-operative hospital stay, which is expressed as median (range). Regarding the trends of the platelet counts (Figure 1 A), prothrombin activity, (Figure 1 B), and alanine aminotransferase levels (Figure 1 C) through POD7, there were no significant differences between the NEI and control groups. In contrast, the levels of IL-6 on POD1 (NEI group: 113.2 pg/mL [26.9 - 522.0] vs. control group: 174.0 [28.6 - 1006.0], P < 0.001) and on POD3 (NEI group: 74.0 pg/mL [30.1 - 239.4] vs. control group: 118.9 [22.3 - 314.4], P = 0.007) were significantly lower in the NEI group than the control group, but did not differ significantly thereafter (Figure 2). There was no significant difference in the platelet count (A), prothrombin activity (B), and alanine aminotransferase concentration (C) between the NEI (Neutrophil Elastase Inhibitor) group (white box with dotted line) and the control group (black box with line). Op: operation, POD; postoperative day, N.S; not significant. The serum interleukin-6 (IL-6) levels were significantly suppressed in the NEI (Neutrophil Elastase Inhibitor) group (white box) than in the control group (grey box). The significance was found by POD3 and returned to a low level by POD5. Data are expressed as the median and range. POD: postoperative day. The alveolar-arterial oxygen tension difference on POD3 was significantly better in the NEI (Neutrophil Elastase Inhibitor) group (white box) than in the control group (grey box). Data are expressed as the median and range. POD: postoperative day. NEI reduced the rate of inflammatory responses, peripheral alveolar injury and postoperative pulmonary effusion following liver resection. However, the liver and coagulation functional recovery as well as severe grade complications did not seem to be affected by the NEI treatment. NEI is thought to suppress proinflammatory cytokines and attenuate various types of tissue injury (11-23). In the present study, IL-6 was used as a simple measure of injury severity and a predictor of complications after liver resection (24). The serum IL-6 levels rapidly elevated just after the operation and then returned to close to baseline levels by POD5. 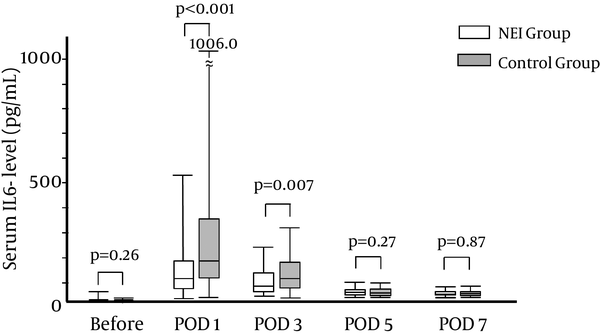 The elevation of serum IL-6 postoperatively was significantly lower in the NEI group than in the control group, as previously found in cardiovascular, thoracic and esophageal surgeries (7-10). In addition, AaDO2 reflects peripheral alveolar injury caused by surgical stress or intraoperative mechanical ventilation. The present study showed the positive impacts of NEI administration on the AaDO2 value after liver resection. Therefore, NEI may have a positive impact on the pulmonary complications by inhibiting NE activity. NEI achieved a positive outcome in the experimental models of ALI and phase 3 trials (5, 6). However, a large multicenter randomized prospective trial on severe septic patients did not confirm this positive outcome (25). NEI may be effective for prophylactic use, but ineffective for patients with extremely severe conditions (6, 8, 9). In the present study, the NEI administration affected the inflammatory response alone and resulted in reducing pleural effusion. Several studies showed a favorable effect of NEI in ischemia-reperfusion injury (11-13). A significant reduction of the serum IL-6 levels and high mobility group box protein 1 release were observed in a clinical trial (15). Therefore, a positive effect of coagulation factors was speculated in these studies (11-15). These studies concluded that NEI has a protective effect on hepatic injury by suppressing the neutrophil elastase activity during liver surgery. However, there were no data concerning the liver and coagulation recovery after liver resection. To avoid any selection bias, a matched cohort analysis was used to adjust for the patients’ background data. As a result, a positive effect on the serum IL-6 levels and AaDO2 values were confirmed as described previously (11-15). However, there were no significant differences in the liver function, coagulation activity and non-respiratory complications between the NEI and the control groups. Thus, the therapeutic impact of NEI for liver parenchyma after ischemia-reperfusion injury may be limited (12, 13, 15). In conclusion, treatment with NEI significantly reduced the postoperative inflammatory response and had a protective impact on the respiratory function by attenuating the NE activity, however, no protective impact on the liver function was observed. To avoid any selection bias, a matched cohort study was conducted; however, the study spanned three years. Therefore, the perioperative management for liver resection is different (postoperative drain management and indications for fresh frozen plasma). These data may be slightly affected by the postoperative outcomes (terms for postoperative hospitalization and frequency of adverse events concerning blood transfusion). However, the effect of these variables might be only minor. Author’s Contribution: Shintaro Yamazaki and Tadatoshi Takayama: designing the study and writing the manuscript; Masamichi Moriguchi: performing statistical evaluations; Yuki Hayashi, Yusuke Mitsuka, and Nao Yoshida: managing the protocol of study; Tokio Higaki, Shintaro Yamazaki, and Tadatoshi Takayama: performing the operations.